Women’s basketball has a trio of freshmen guards ready to start. 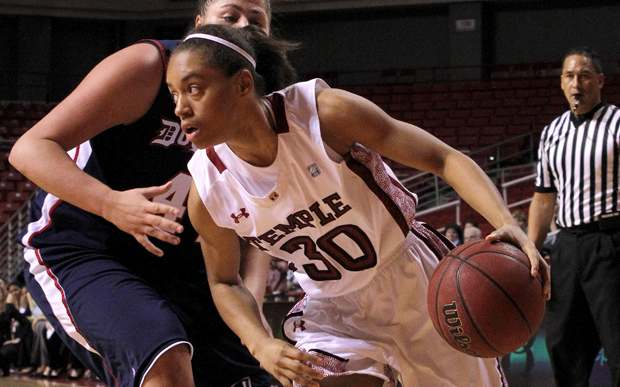 The women’s basketball team’s defeat of Big-5 rival Penn saw a mix of the old and the new. Senior guards Shey Peddy, Kristen McCarthy and BJ Williams gave way to the future – freshmen guards Monaye Merritt, Tyonna Williams and Rateska Brown – in garbage time of a 72-47 blowout. “It was good to have all three of them out there, and playing together, and trying to figure things out on their own and not being able to look over to [BJ Williams and Peddy] for the answers,” coach Tonya Cardoza said. It’s a critical time for the fledgling Owls, who have to learn quickly. Peddy, McCarthy and BJ Williams are the only guards on the roster with starting experience and all three will play their last games in March. Next year there’s no more being weaned into the system. Next year Cardoza will push Merritt, Tyonna Williams and Brown into starting roles. And the process has already begun as Tyonna Williams and Merritt are consistently coming off the bench to spell the seniors. The pressure they feel is the pressure of replacing two of the best guards to walk into Temple in McCarthy (1,433 career points) and Peddy (1,605 career points at Wright State and Temple). JAZMYNE ANDERSON TTN Freshman guard Monaye Merritt is one of three freshmen guards to see playing time for the women’s basketball team this season. Merritt averages 11.6 minutes per game. “Whoever’s out on the floor they’re playing with confidence and that’s half the battle right there,” Cardoza added. Tyonna Williams has seen the most action this season, playing in 17 games and starting two. The Maryland native has averaged 3.5 points in 15.7 minutes per game, including a career-high 11 points in a loss to Rutgers in November. 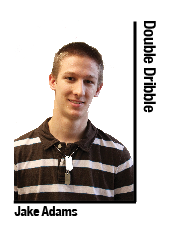 Merritt hasn’t been as flashy, but has shown a better ability to run the offense with each game. The lone Philadelphian on the team, she’s played in 12 games and averaged 1.8 points and 12.1 minutes per game, including a career-high six points in the Owls’ win against Dayton last week. Brown has been left behind a bit compared to her classmates. She’s played in 10 games, averaging two points and 6.3 minutes per game. The Owls’ signed a fourth freshman guard, Shaniqua Reese, but she was injured in the preseason and is currently not on the roster. Life hasn’t been easy for the freshmen trio. Every day in practice is a battle with the upperclassmen, but it’s all meant to prepare them for next year. Despite the “lead” that Merritt and Williams have on Brown and Reese, it’s anybody’s ballgame next year to fight for the starting spots.